Lyme disease is a complex and terrifying illness. We have compiled some of the most recent knowledge regarding this disease here for your reference. If testing is right for you, please use the Order Kits button at the bottom of the page to request test kits or have your healthcare provider contact us to request test kits upon your behalf. Lyme disease is a bacterial infection caused by the spirochete, Borrelia burgdorferi. Interestingly, additional Borrelia species have been shown to cause similar diseases. These species include: B. garinii, B. afzelii, and B. miyamotoi. Wilhelm Burgdorfer, a Swiss zoology and microbiology researcher spent much of his later career at the Rocky Mountain Laboratory in Hamilton, Montana, and is credited with the discovery of Lyme disease. By using chemical staining and light microscopy techniques, William Burgdorfer was able to detect spirochetes that were found in deer ticks. At least 36 distinct species of Borrelia have been discovered, with at least 12 able to cause disease. Recent research has suggested that there are two main groups of Borrelia species with one group appearing to be responsible for Lyme or Lyme-like diseases and the other group responsible for relapsing fever related diseases . Image: J. Berger, Science Photo Library. The genomic sequence of B. burgdorferi strain B31 has a core genome of 910,725 base pairs with at least 17 additional genomic plasmids that add up to an additional 533,000 base pairs. Approximately 853 genes control cellular function and replication. At the time of its sequencing in 1997, the majority of the 430 genes on the plasmids did not have any known function . However, subsequent research has demonstrated that these plasmid-borne genes contribute to the disease causing nature of the organism [3,4]. Image: U.S. National Library of Medicine. Lyme disease is transmitted by tick bites. The prime environmental reservoirs for the Borrelia species include deer, mice, squirrels, and lizards. In endemic areas, the primary vector for B. burgdorferi is the Ixodes tick. Borrelia species are more prevalent in Europe and the United States, but pathogenic strains have been observed on all continents except for Antarctica. In the United States, Borrelia is commonly found on the East Coast, the Midwest, and Northwestern states; however, most of the clinical cases are concentrated in the Northeast and upper-Midwest United States. Additionally, several studies have demonstrated a low prevalence of potential reservoirs and insect vectors in the Southwest U.S. . The hot and arid conditions associated with the Southwest are likely inhospitable for known tick vectors [6,7]. Image: Centers for Disease Control and Prevention (CDC). The typical symptoms of Lyme disease may include the classic erythema migrans “bulls-eye” rash, fever, malaise, meningitis, headache, photophobia, joint, and muscle pain. There are several additional infections that can “hitch-hike” with Borrelia species as they share the same insect vector, tick, and mode of transmission, bite . These infections, known as co-infections, include Anaplasma, Ehrlichia, and Babesia species. Frequently these co-infections are overlooked when Lyme disease is suspected; however, these organisms can cause significant illness as well. Lyme disease testing is performed by a trained clinical laboratory scientist using several testing techniques. These testing technologies include microscopy, culture, detection of specific biomarkers or proteins, serology (antibody testing), metabolite detection, and molecular diagnostic assays. The currently available tests can be divided into two major categories based on the technological approach, direct and indirect. Direct tests assay for direct evidence of the microbe. Direct tests include observation by microscopy, culture (growing the organisms from patient samples), and molecular methods that detect an organism’s unique molecular signature. Microbial culture is considered the “gold standard” direct testing method; however, not all organisms may be effectively, reliably, or conclusively cultured. Overall, direct testing methods are considered some of the most convincing testing methods in microbiology. Indirect test methods seek to measure how the patient’s body or cells respond to a marker assumed to be representative of the pathogen. Furthermore, this method assumes that the detection of a response is evidence of exposure. These tests include serological tests such as immunofluorescence assays, western blots, ELISAs (Enzyme Linked Immunosorbent Assays), or lymphocyte response assays. Indirect tests, while generally less specific than direct tests, may still be powerful diagnostic tools in the diagnosis of a specific disease. It is widely recognized by immunologists and microbiologists that a patient’s exposure to other organisms can produce similar immune responses, where the antibodies produced by the patient can cross-react with other organisms or markers. This effect may result in false positive results for certain serological tests. 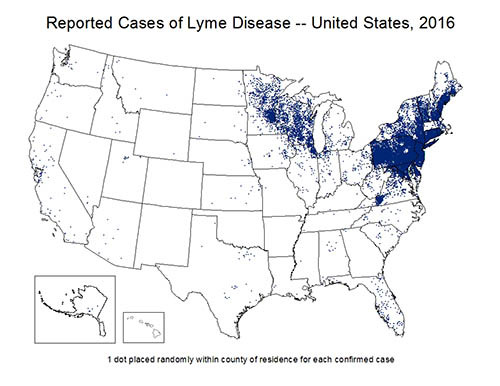 The CDC recommends Lyme disease testing to be performed in a two-steps process. The first step is testing by a screening EIA (enzyme immunoassay) or an IFA (indirect immunofluorescence assay) for B. burgodorferi . If the screening test result is positive or indeterminate (equivocal), then a confirmatory Western blot should be performed. Most serologic tests aim to detect antibodies produced by the body in response to an antigen or foreign protein. Several Borrelia proteins, such as p41 or p23, are commonly recognized by the body’s immune system as foreign; therefore, are used as markers of exposure. In infectious disease diagnostics, there are two relevant classes of antibodies; IgG and IgM. IgM antibodies are the early response antibodies and are eventually replaced by IgG antibodies that persist and confer long term immunity to infections. The standard criteria for the Lyme Western Blot requires 5 out of 10 bands (proteins) for a positive IgG result or 2 out of 3 bands (proteins) for a positive IgM result. Antibody cross-reactivity with other microorganism proteins is one of the main reasons for the band count criteria. Simply, the antibodies produced to fight a different organism, for example the spirochete that causes Syphilis (Treponema pallidum), can similarly bind to proteins of Borrelia sp. and yield a “false-positive” result . It has been documented that some individuals can have a diminished response to antigens. This effect is called anergy . Anergic individuals, when tested for antibodies by any serology test would yield a false negative result. Two relatively new Lyme disease antigen detection assay technologies have been FDA approved/cleared; the “C6 Lyme peptide ELISA” and the “Prevue B. burgdorferi” tests [11,12]. Another available type of indirect assay is the lymphocyte activation-based assays, ELISpot (Enzyme-Linked Immunospot) [13,14]. Interestingly, the species Borrelia miyamotoi, is not reliably detectable by standard Western Blot and requires a targeted serology, PCR (targeted or genus wide), or DNA sequencing for conclusive detection. This newly recognized species is thought to represent over 10% of the Lyme cases in the United States and may be significantly under-diagnosed [15-18]. Testing for the molecular signature of an organism is the newest and most accurate testing method in microbiology. This direct testing approach includes methods such as polymerase chain reaction (PCR) and Next-Generation DNA sequencing (NGS). The use of methods like these have been shown to have excellent performance [19,20]. PCR is a technique that is used to amplify specific DNA fragments and can be used effectively to detect an organism. Multiplex PCR is similar to PCR, but multiple targets or organisms may be detected simultaneously. Multiplex PCR is currently used for microbial detection for common infections. Two new direct molecular detection systems for broad characterization of microbial populations have been developed. First, the Abbot IRIDICA system uses an initial PCR step to amplify a microbial DNA fingerprint that is detected by mass spectroscopy electron spray ionization. The subsequent fingerprint is used for identification [21-23]. This methodology is similar to other MALDI-TOF systems, but detects the PCR product instead of protein signatures [21,24]. Even though these systems are rapid and have a broad range of detectable organisms, they are limited by the organisms included in the fingerprint comparative database. The use of DNA sequencing technologies is becoming increasingly common in diagnostic laboratories. By adapting technologies that are currently used to sequence human genes, a few laboratories are using DNA sequencing to great success in microbiology. These platforms allow for an unbiased detection approach. A version of unbiased detection, metagenomics, is the ability to characterize the microbial genetic diversity in a biological sample. 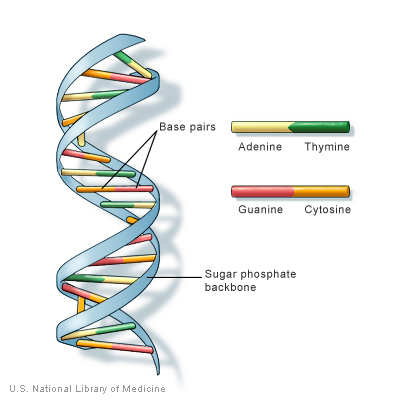 Whole genome sequencing, aka shot-gun sequencing, is another method to learn about a microbe by sequencing many random fragments from a microbial isolate. Lastly, targeted community profiling, involves specific amplification of DNA from biological samples prior to sequencing. The use of DNA sequencing as a microbial detection and identification tool requires successful integration of biochemistry, microchip measurements or fluorescent imaging, and computational analysis methods. It is also important to note that sequencing can detect and characterize previously unknown organisms because of its non-exclusionary approach of DNA sequencing. In addition, these strategies may allow for the characterization of mixed populations of organisms. Due to advantages of DNA sequencing it may address many of the outstanding questions in infectious disease research. Adeolu M, Gupta RS. A phylogenomic and molecular marker based proposal for the division of the genus Borrelia into two genera: the emended genus Borrelia containing only the members of the relapsing fever Borrelia, and the genus Borreliella gen. nov. containing the members of the Lyme disease Borrelia (Borrelia burgdorferi sensu lato complex). Antonie van Leeuwenhoek. Jun 2014;105(6):1049-1072. Fraser CM, Casjens S, Huang WM, et al. 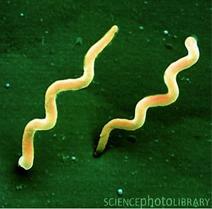 Genomic sequence of a Lyme disease spirochaete, Borrelia burgdorferi. Nature. Dec 11 1997;390(6660):580-586. Iyer R, Kalu O, Purser J, Norris S, Stevenson B, Schwartz I. Linear and circular plasmid content in Borrelia burgdorferi clinical isolates. Infection and immunity. Jul 2003;71(7):3699-3706. Purser JE, Lawrenz MB, Caimano MJ, Howell JK, Radolf JD, Norris SJ. A plasmid-encoded nicotinamidase (PncA) is essential for infectivity of Borrelia burgdorferi in a mammalian host. Molecular microbiology. May 2003;48(3):753-764. Feria-Arroyo TP, Castro-Arellano I, Gordillo-Perez G, et al. Implications of climate change on the distribution of the tick vector Ixodes scapularis and risk for Lyme disease in the Texas-Mexico transboundary region. Parasites & vectors. 2014;7:199. Huycke MM, D’Alessio DD, Marx JJ. Prevalence of antibody to Borrelia burgdorferi by indirect fluorescent antibody assay, ELISA, and western immunoblot in healthy adults in Wisconsin and Arizona. The Journal of infectious diseases. Jun 1992;165(6):1133-1137. Olson CA, Cupp EW, Luckhart S, Ribeiro JM, Levy C. Occurrence of Ixodes pacificus (Parasitiformes: Ixodidae) in Arizona. Journal of medical entomology. Nov 1992;29(6):1060-1062. Weiman S. Sometimes Baffling Tick-borne Microbial Illnesses Continue to Emerge. Microbe. 2015;10(1). Naesens R, Vermeiren S, Van Schaeren J, Jeurissen A. False positive Lyme serology due to syphilis: report of 6 cases and review of the literature. Acta clinica Belgica. Jan-Feb 2011;66(1):58-59. Kantor FS. Infection, anergy and cell-mediated immunity. The New England journal of medicine. Mar 20 1975;292(12):629-634. Wormser GP, Liveris D, Hanincova K, et al. 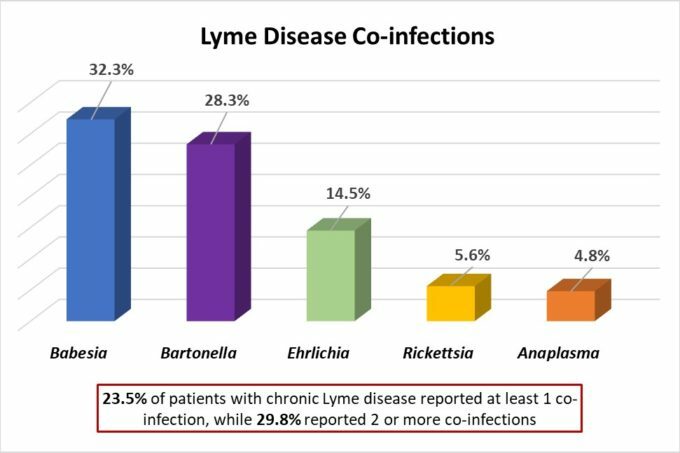 Effect of Borrelia burgdorferi genotype on the sensitivity of C6 and 2-tier testing in North American patients with culture-confirmed Lyme disease. Clinical infectious diseases : an official publication of the Infectious Diseases Society of America. Oct 01 2008;47(7):910-914. Wormser GP, Schriefer M, Aguero-Rosenfeld ME, et al. Single-tier testing with the C6 peptide ELISA kit compared with two-tier testing for Lyme disease. Diagnostic microbiology and infectious disease. Jan 2013;75(1):9-15. Nordberg M, Forsberg P, Nyman D, et al. Can ELISPOT Be Applied to A Clinical Setting as A Diagnostic Utility for Neuroborreliosis? Cells. Jun 08 2012;1(2):153-167. Jin C, Roen DR, Lehmann PV, Kellermann GH. An Enhanced ELISPOT Assay for Sensitive Detection of Antigen-Specific T Cell Responses to Borrelia burgdorferi. Cells. Sep 13 2013;2(3):607-620. Crowder CD, Carolan HE, Rounds MA, et al. Prevalence of Borrelia miyamotoi in Ixodes ticks in Europe and the United States. Emerging infectious diseases. Oct 2014;20(10):1678-1682. Krause PJ, Fish D, Narasimhan S, Barbour AG. Borrelia miyamotoi infection in nature and in humans. Clinical microbiology and infection : the official publication of the European Society of Clinical Microbiology and Infectious Diseases. Feb 18 2015. Krause PJ, Narasimhan S, Wormser GP, et al. Borrelia miyamotoi sensu lato seroreactivity and seroprevalence in the northeastern United States. Emerging infectious diseases. Jul 2014;20(7):1183-1190. Lee SH, Vigliotti JS, Vigliotti VS, Jones W, Moorcroft TA, Lantsman K. DNA sequencing diagnosis of off-season spirochetemia with low bacterial density in Borrelia burgdorferi and Borrelia miyamotoi infections. International journal of molecular sciences. 2014;15(7):11364-11386. Buchheidt D, Reinwald M, Hofmann WK, Boch T, Spiess B. Evaluating the use of PCR for diagnosing invasive aspergillosis. Expert review of molecular diagnostics. Jun 2017;17(6):603-610. Punia H, Gathwala G, Dhaulakhandi DB, Aamir M. Diagnosis of neonatal sepsis using 16S rRNA polymerase chain reaction. Tropical doctor. Jan 01 2017:49475517701875. Egli A, Osthoff M, Goldenberger D, et al. Matrix-assisted laser desorption/ionization time-of-flight mass spectrometry (MALDI-TOF) directly from positive blood culture flasks allows rapid identification of bloodstream infections in immunosuppressed hosts. Transplant infectious disease : an official journal of the Transplantation Society. Feb 19 2015. Halliday CL, Kidd SE, Sorrell TC, Chen SC. Molecular diagnostic methods for invasive fungal disease: the horizon draws nearer? Pathology. Apr 2015;47(3):257-269. Sloots TP, Nissen MD, Ginn AN, Iredell JR. Rapid identification of pathogens using molecular techniques. Pathology. Apr 2015;47(3):191-198. Marko DC, Saffert RT, Cunningham SA, et al. Evaluation of the Bruker Biotyper and Vitek MS matrix-assisted laser desorption ionization-time of flight mass spectrometry systems for identification of nonfermenting gram-negative bacilli isolated from cultures from cystic fibrosis patients. Journal of clinical microbiology. Jun 2012;50(6):2034-2039.